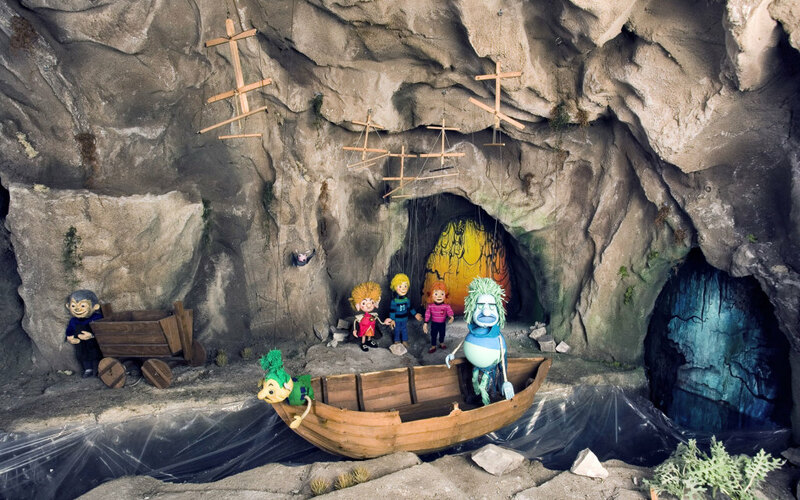 Generations of German children have grown up with Jim Button and Impy´s Island. 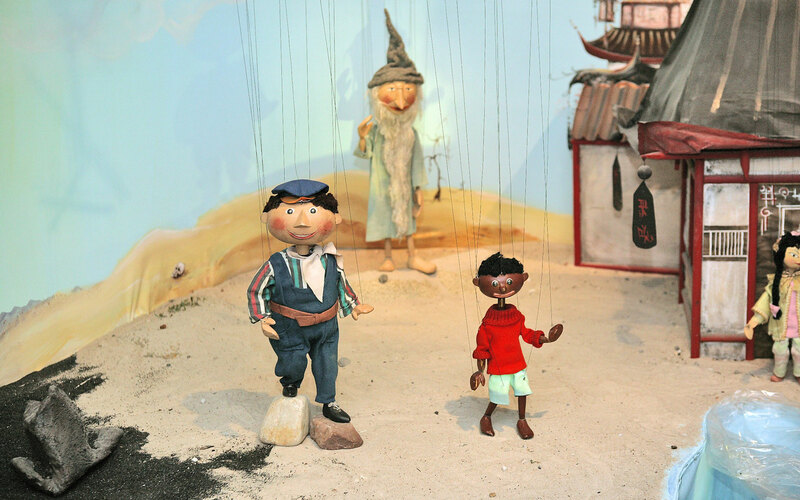 For over 66 years, the little dolls of the Augsburg Puppet Theatre inspire young and old. Even today, at the historical Holy Spirit Hospital, constructed by the Augsburg city architect Elias Holl, the ensemble around theatre director Klaus Marschall still shows vivid theater for children and adults. The Munich Metropolitan Region is impressive for the wide variety of its artistic and cultural offerings. Besides a theatre and opera houses of world renown, there are many more stages and theatres that are held in high esteem. One of these smaller establishments is standing out as an extraordinary gem, a gem that over the past decades has won an audience of millions throughout Germany. In fact, there are not many children – and even fewer adults – who do not know them: “Urmel”, the baby dinosaur fidgeting on “Titiwu” Island, and his foster mother, a sow named “Wutz”; or the small island of “Morrowland” and its in­hab­itants “Jim Button” or “Luke”, the engine driver, who are known to millions of people. And these are just the most illustrious protagonists of the most famous of German pup­­pet theatres, the “Augsburger Puppenkiste”. The marionette theatre, established by Walter Oehmi­chen and his family as “Puppenschrein” (puppet chest) in 1943, was continued after the war, from 1948, under the name of “Augsburger Puppenkiste”, by the same family. The repertoire consisted of classic fairy tales from the Grimm Brothers’ collection, by Wilhelm Hauff and from One Thousand and One Nights, mostly performed by professional actors. In the 1960s, Otfried Preußler’s famous stories were added. The Robber Hotzenplotz (1966) became the most popular piece of the theatre. And The Little Witch (1971), too, has been performed without alterations since its inauguration. Yet the topics addressed by Augsburger Puppenkiste are not exclusively aimed at children and young people. Oehmichen, who also worked as director at the municipal theatre of Augsburg, in 1951 achieved the breakthrough of the theatre with a challenging production of The Little Prince by Antoine de Saint-Exupéry. Other sophisticated pieces include Bertolt Brecht’s Threepenny Opera, which was first staged in 1960, and Friedrich Dürrenmatt’s The Trial of the Donkey’s Shadow. Even some operas by Mozart served as source material for plays performed by the singing actors of Puppen­kiste. Whether The Magic Flute or The Abduction from the Seraglio, the performances were successful even without those great, stunning arias. In the Mozart Year of 2006, Augsburger Puppenkiste staged the classical theme of Don Giovanni as Don Giovanni and the Stony Guest. The part of Don Giovanni’s servant was played by the “Kasperl” marionette of Puppenkiste, which gave the show a funny touch of its own. Augsburger Puppenkiste has been considered a national cultural asset since the plays were broadcast nationwide on public television. 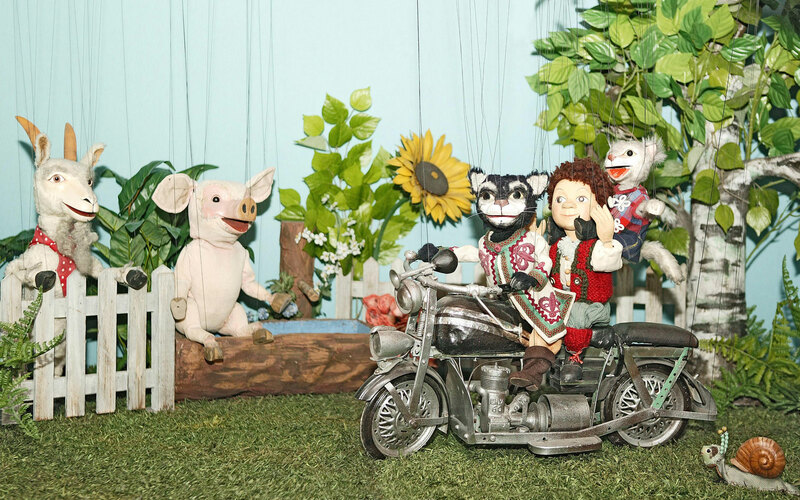 The live performance by the Puppenkiste puppeteers of Peter and the Wolf, aired on 21 January 1953 by the North German broadcasting company NWDR from their Hamburg-based “bunker”, marked the beginning of a success story, which continues to this day. Later on, the programmes were variously recorded by the Bavarian and Hessian broadcasting corporations. Manfred Jenning, the usual Pup­penkiste author, developed a series for television. Because of the huge technical challenge and an increasing de­mand for sequel stories on TV, the stage performances were separated from the television programmes early on. Some of the first “stars on strings” were – still filmed in black and white – The Moomin Family (1959/60, two serials), Jim Button and Luke, the Engine Driver (1961/62, two serials, re-produced in colour in 1976), The Fat Little Knight (1963), Klecksi, der Tintenfisch (Klecksi, the octo­pus, 1963), most of which was imprudently destroyed, and Purrkin, the Talking Cat (1964). Except for a short interval at Bavarian Broadcasting (1956–1958), as from 1954, all sequels were made in cooperation with the Hessian broadcasting corporation. From 1965 on, Puppenkiste on TV was in colour, one of the most popular productions of the time being Urmel aus dem Eis (1969; later filmed as cartoon and translated Impy’s Island). But the audience enjoyed the Lion trilogy (1965–1967), The Robber Hotzenplotz (1967) and Bill Bo (1968) just as much. Max Kruse was one of the authors who provided most of the stories for the films. Besides Lion on the Loose, The Flying Lion, Well Roared, Lion and another Urmel story (Urmel spielt im Schloss – Urmel playing in the castle, 1974), the film Don Blech und der goldene Junker (Don Scrap and the golden squire, 1973) and the wild west adventure Lord Schmetterhemd (1978) were also based on his books. The scripts for these TV successes were written by the late Manfred Jenning, who died in 1979. The great successes of the 1960s and 1970s continued even after the advent of private television and the associated changes in television-programme culture. In 1997, Augsburger Puppenkiste made it to the cinema with Die Story von Monty Spinnerratz, based on A Rat’s Tale by Tor Seidler, an American author of children’s books. The film was a success: about one million cinema goers watched (rat) marionettes and humans interact in the sewers and piers of New York. The film won the Bavarian Film Award for best children’s film. In 2005/2006, “Schlaubär Ralphi”, a clever little bear, start­ed to explore the world on the Bavarian science channel BR-alpha, and has since dealt with a large variety of topics. Augsburger Puppenkiste, which deserves to be considered a national cultural asset, includes a marionette museum extending over 570 square metres, which offers educational activities. This museum, called “die Kiste” (the chest), has meanwhile, like the theatre itself, become the most successful facility of its kind in the whole of Europe. 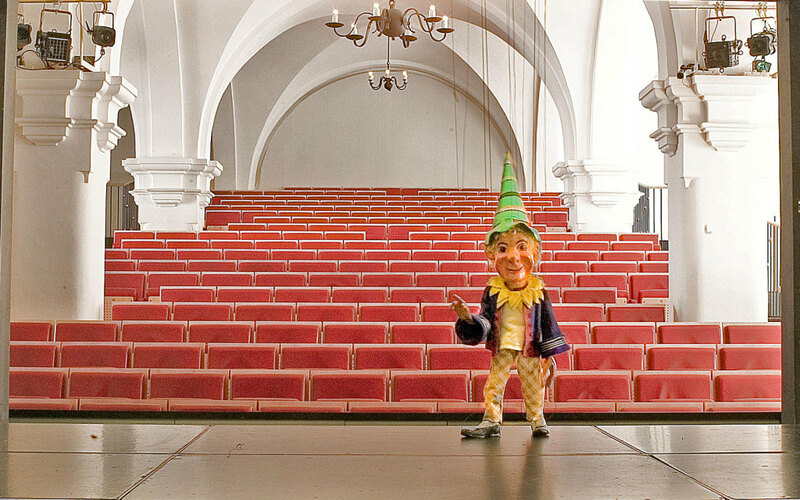 The Puppenkiste theatre is not only an integral part of the city of Augsburg and the Munich Metropolitan Region – today it is impossible to imagine German stages, theatres and television programmes without it. The author, born in 1961, is the director and owner of the marionette theatre Augs­burger Puppenkiste. Mr Marschall, who started his career as a puppeteer at the age of twelve, took over as director of Puppenkiste in 1992. Since 1948, the theatre has held almost 21,800 performances in front of more than four and a half million people. Puppenkiste has been aired on national television since 1953.